If you could save just one object from an earthquake, what would you choose? 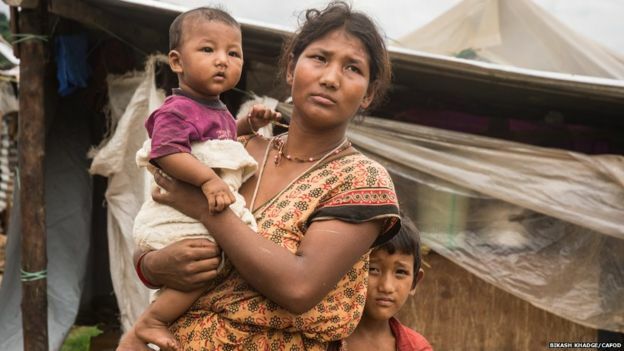 Three months on from the Nepal earthquakes that killed thousands and devastated the capital and its surrounding areas, nine survivors tell the stories of the precious items they managed to salvage. Dalli lives in the village of Chandani, where several people lost their lives during the earthquake. 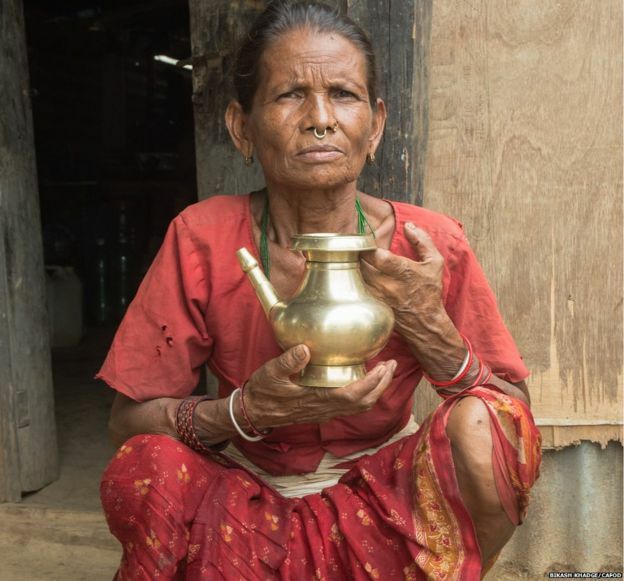 After her home was destroyed, she dug through the rubble to rescue her brass water jug. “Somehow in all the chaos I found my water jug. I can’t remember how long I searched for it, I just kept searching. I had worked many hours in the field to save up and buy this water jug. 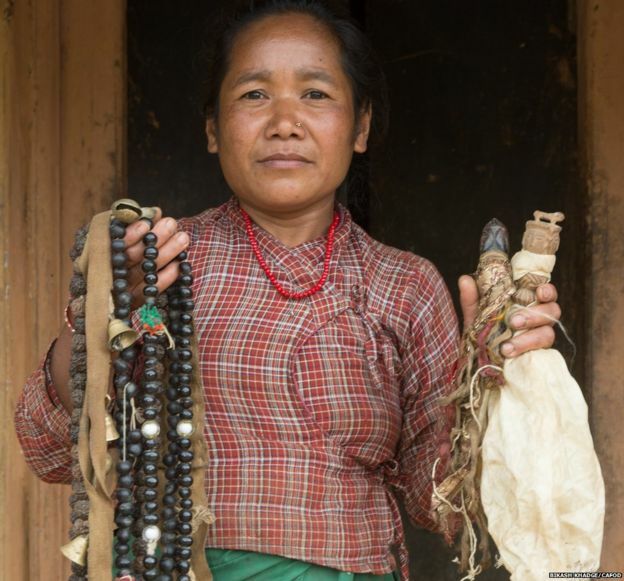 I had had to travel to the neighbouring village to buy it,” she says. A few minutes before the earthquake hit, Meena put Sundari, her seven-month-old baby, into a wicker basket. While the baby slept, she took her grain to the mill to be ground – but then the earth started rumbling. “I ran home. I ran while the ground was still shaking under my feet,” she says. By the time Meena got home, her house had collapsed, and a wooden beam had fallen on the baby’s wicker basket. She could hear Sundari crying so she knew she was still alive. She says that for a desperate hour, she scrabbled through the rubble to free her child – eventually some neighbours were able to help, and together they freed Sundari, who was covered in scratches, but not seriously injured. Sangata keeps her most precious items – a collection of brown and black beads, small brass bells and what look like carved effigies or figurines – wrapped tightly in a muslin beige cloth. Rahar’s house was badly damaged in the earthquake, and is now held together with corrugated iron sheeting and tarpaulin. 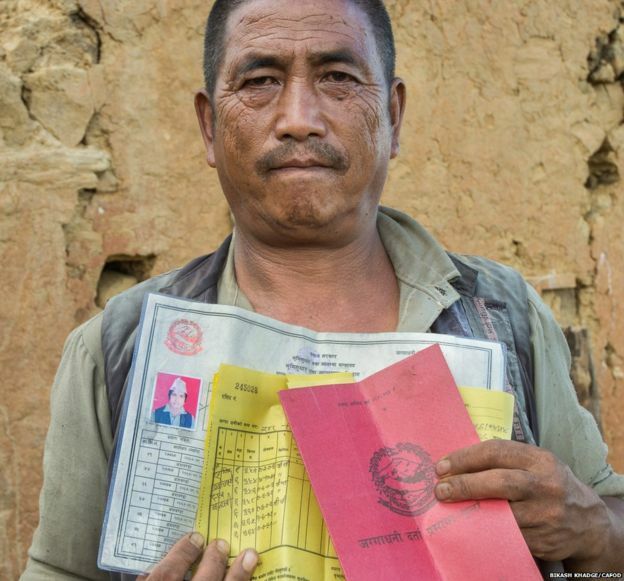 He says the most important items he saved were the “Larja Purja” – or red papers – which are his certificates for proof of land and house ownership, as well as the yellow papers that prove he has paid his taxes. “My Larja Purja papers were kept inside a small black book that I keep locked. For the first days after the quake I could not return to our home, because the shaking just kept coming. Then, after about 10 days, I found the courage to go inside and get the box. Clasping what looks at first sight like a rusty hub-cap, Panch breaks out into a smile as she makes rhythmic music with her instrument – a home-made drum made out of deer skin. 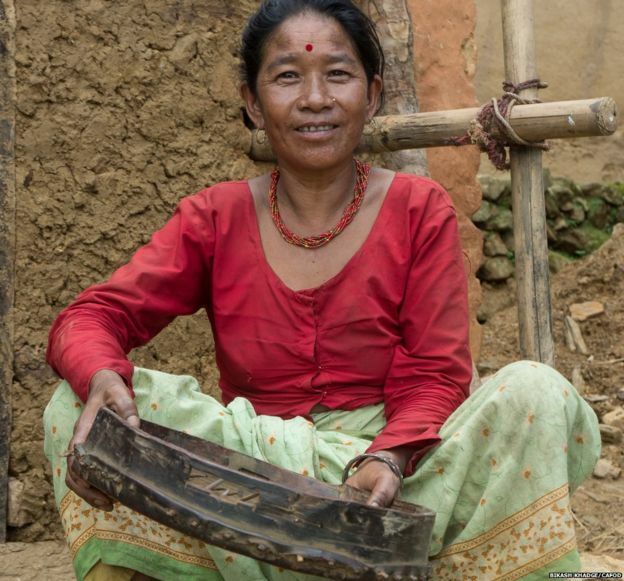 She regularly plays the drum at weddings and religious festivals, and she was desperate to save it after the earthquake. 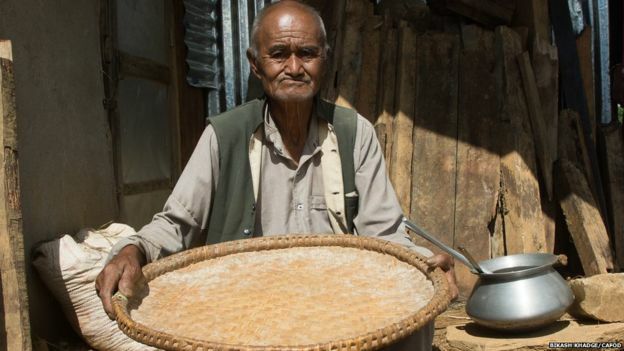 Krisma lives in the village of Balthali, which sits on a plateau amid terraced rice fields. 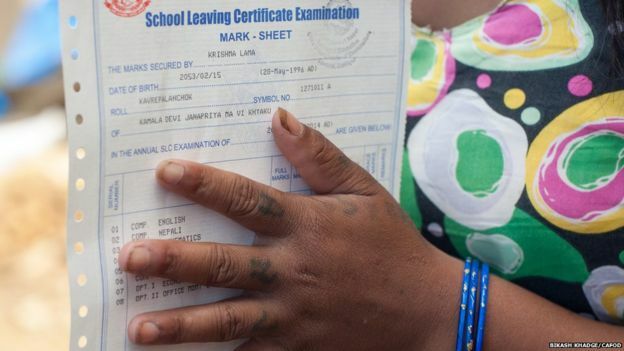 Krisma had already sat her School Leaving Certificate (SLC) exams before the earthquake struck. Without the certificate to show that she had passed, however, she would not have been able to continue her education. Shyam says his home was taken down after the earthquake by the army, as it was deemed unsafe, teetering on the edge of a cliff top. The most precious item he saved was his wicker grain separator. “I was right here in the house when the earth started to move. I spent a lot of time dashing in and out of the house collecting my belongings. 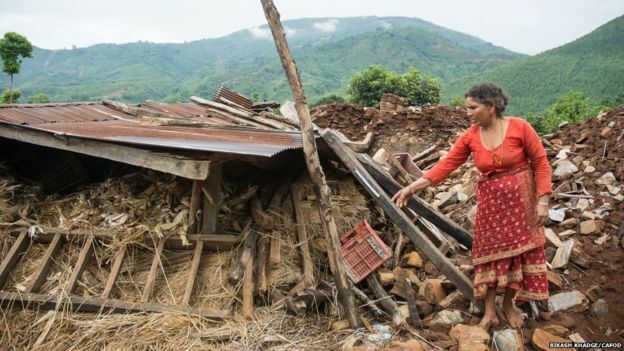 Suku says her five-year-old son was playing outside the house when the earthquake struck, and her 15-year-old daughter was working in a nearby field. “When the shaking started, it was difficult to keep a hold of my son. He kept slipping through my hands, like rice grain through fingers,” she says. “I don’t know how, but I rushed inside the house and pulled out our sack of rice, and ran down the hill holding my son and the sack. “I met my daughter down in the village. She was crying, and we were all afraid. Rama remembers working in the fields when the earthquake struck. She ran home to make sure that members of her family were safe – but after that, she was determined to rescue her prized calf, Gajali. Animals are crucial to subsistence farmers like Rama, providing milk, meat and a source of income. They are also an important part of the spiritual life of communities. Rama named her calf Gajali – which means “eyeliner” – because of the animal’s sensuous eyes, which look as if they have eyeliner around them. 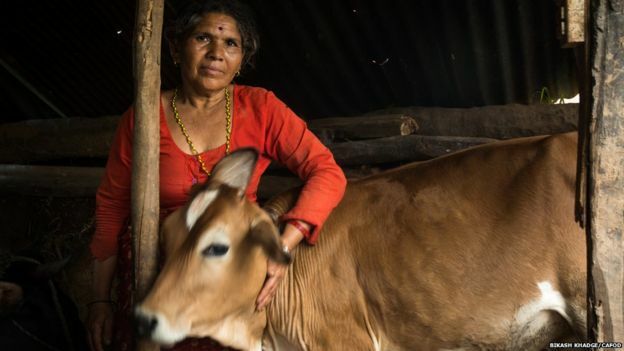 Rama says two of her cows and five of her goats were killed in the earthquake, and she spent three days digging through rubble to find Gajali. She says: “I heard no sound from Gajali, after digging the earth looking for her. Then on the third day as I was moving the earth, I saw her tail shake. Many people in the village came to help me dig her out.